It had become habit to me to eat very few eggs, mainly because of the way the hens were raised, and partly because of misguided health messaging from heart institutes. Now, however, eggs have been finally given the all "ok" stamp (about time) and an abundant source of eggs are available from farmers who actually care about the hens, and feed them as my grandma would have. What joy to see those bright orange yolks I'd given up seeing anywhere except the UK and Europe, and tasting eggs from hens that peck around outside and from food scraps. Ever since winning a trip to France for a recipe I created once to pair with Houghton's White Burgundy, I've had a penchant for throwing my hat in the ring, this time for Eggland's Best, who are sourcing eggs from farmers over America with strict guidelines on how they are raised, never any antibiotics or hormones, and lots of good stuff in their food. Here's my two recipes that were great fun to play with - the rule was they had to reflect a sense of where I live, which is currently the Napa Valley. Lot's to play with here. Napa Valley farmer’s markets have some of the most colorful and boldly flavored Heirloom tomatoes and Italians galore, so Caprese Salad is almost an institution here, not to mention the abundance of fresh herbs and locally made olive oils. I love poached eggs and tomato together so decided to substitute the mozzarella with eggs poached in rings. The yolks ooze out over the tomato, making a sumptuous treat to dip the bread in. Local cheesemakers make some beautiful ricotta and goat cheese, so I decided to accompany my Caprese with some of Bellwether Farm’s Ricotta on some Model Bakery Ciabatta. Set aside 8-10 leaves basil and cut into thin slivers. Place the remainder into a blender with the oil and puree until smooth, adding a bit more oil as needed. Strain through a fine sieve and set aside. Bring a pot of water to the boil add, vinegar and salt. Brush a non-stick pan with oil and heat over medium. Place 2 egg rings in pan. Break 2 eggs onto a plate, and pressing rings down, tip egg into ring holding down for a minute. Repeat for other egg. Pour in enough boiling water to come half way up ring and cook for 3-4 minutes, tossing water over egg occasionally to set top. Remove from heat and sit in pan for another 4 minutes. Remove with spatula onto paper towels to drain. Repeat with remaining eggs. While eggs are still warm, place a slice of tomato on each plate, season with cracked pepper and top with some chopped basil. 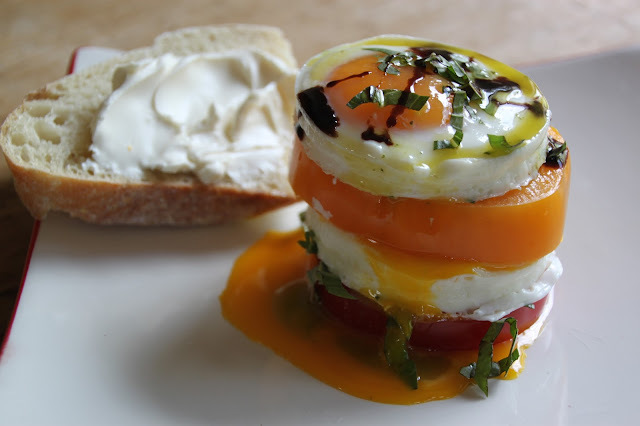 Carefully place an egg on top, then repeat with a different color tomato and finish with egg. Season as desired and just before serving drizzle with balsamic glaze, sliced basil and basil oil. Repeat for second stack and served straight away with the bread. The hills surrounding Napa are studded with wild mushroom and foragers galore are often spotted kicking their way through the forests. As it is the Napa valley, I had to add a red wine glaze! Preheat oven to 375F. Grease the inside of 6-8 desired sized muffin pan or tart tins. Rinse, pat dry and chop the mushrooms into large pieces. Heat oil in a skillet, add the shallot and onion and cook for 1 minute, then add the mushrooms and cook for 2-3 minutes or until soft. Remove from heat and cool slightly. Whisk the eggs and milk, season to taste and fold in the mushroom mixture and herbs. Set aside. Lay a sheet of filo on a dry board, brush with butter, season with pepper and fold once, then brush again. Fold and brush until a size to fit inside the muffin base. Gently fit inside making sure pastry comes all the way up the sides. 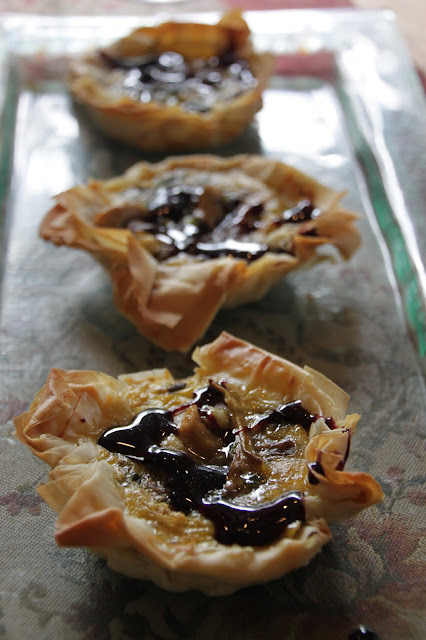 Repeat with remaining filo pastry until you have 6 – 8 lined tarts. Spoon egg and mushroom mixture between tart cases, making sure to divide mushrooms equally. Do not come up over edges. Place in the middle of the oven and cook for 10-12 minutes or until egg is set and pastry is golden brown. 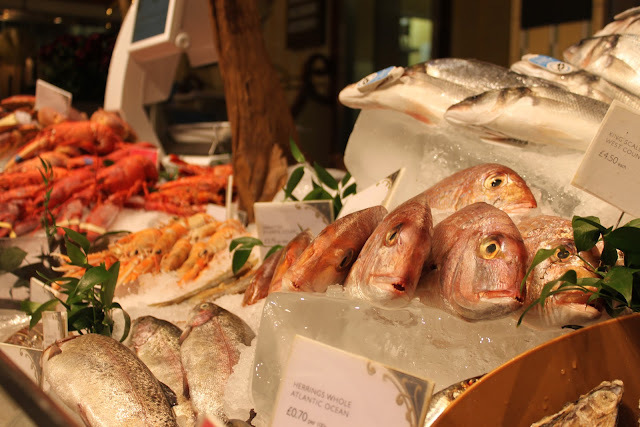 Remove from oven and cool slightly on a wire rack before lifting out of cases. While the tarts are cooking, place the wine and honey in a pan and bring to a simmer. Keep at a simmer for 10-15 minutes, depending on size of pan (keep a careful eye on it), or until it forms a glaze consistency. 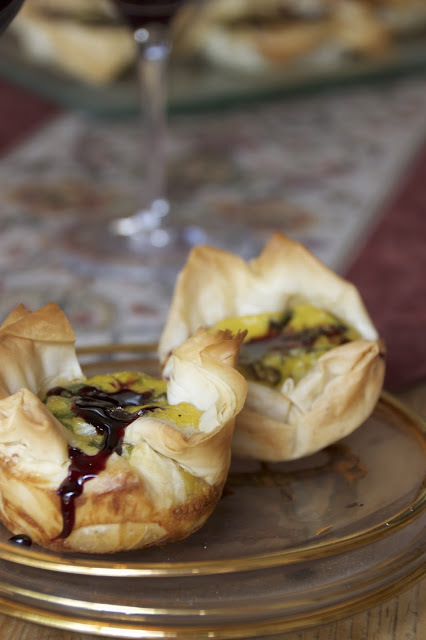 Serve tarts warm with the red wine drizzled over.